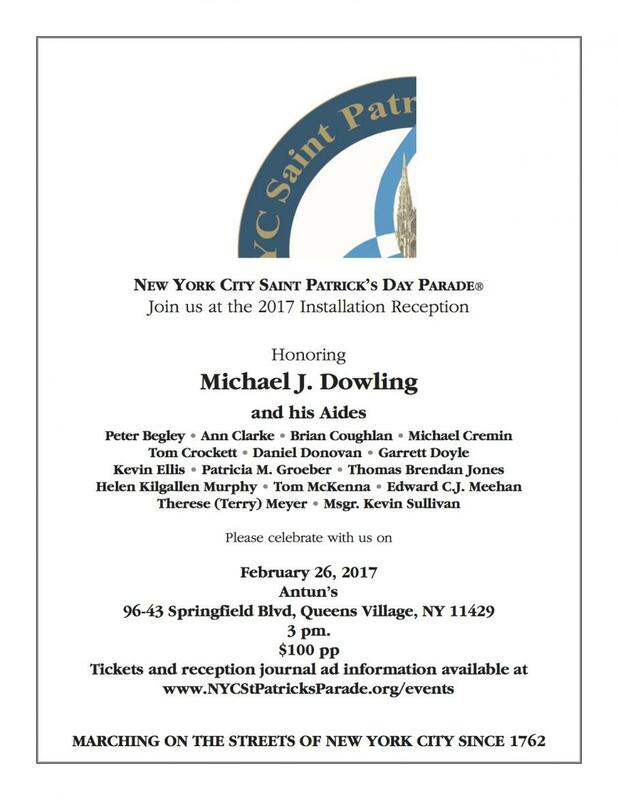 NEW YORK - Feb. 10, 2017 - PRLog -- Join us to honor the 2017 Grand Marshal of the NYC St. Patrick's Day Parade: Michael J. Dowling. Dowling is President and Chief Executive Officer of Northwell Health, which is New York's largest health care provider with 21 hospitals and more than 550 outpatient practices, the state's largest private employer with more than 62,000 employees and $11 billion in annual revenue. In addition to providing world-class clinical care, they are making breakthroughs in medicine at the Feinstein Institute for Medical Research, training the next generation of medical professionals. Prior to joining Northwell in 1995, Mr. Dowling served in New York State government for twelve years. He was director of health, education and human services, deputy secretary, and a chief advisor to former Governor Mario Cuomo. Please celebrate with us on February 26, 2017!